On 21 November 1338, forty-three archers joined the company of troops entrusted with the security of the Isle of Wight. The garrison pay-roll, which forms the greater part of an excellent set of accounts now preserved at the Public Record Office, records the names of the newly arrived men. In their midst is a name as familiar as any from English literature or history: Robin Hood. Should an historian dwell unduly over this hitherto unnoticed reference to England’s most famous outlaw hero? Most informed opinion would probably think not. Barrie Dobson and John Taylor, for example, have argued that ‘the discovery of the name Robert or Robin Hood in a medieval English document is not in itself of particular significance’: it is not an unusual name and plenty of thirteenth- and fourteenth-century examples could easily be cited. Moreover, this new reference is not of particularly early date. 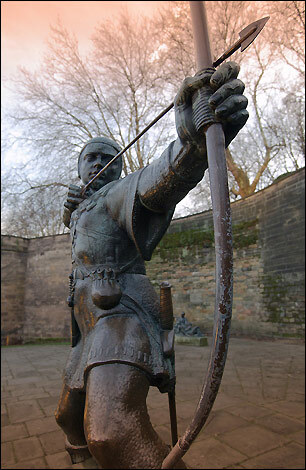 It is the aim of this article to show that, in this case, such scepticism would be misguided; that finding a man· called Robin Hood amongst a company of archers hired for the defence of England at the start of the Hundred Years War is indeed significant in the light it casts on the murky early life of the Robin Hood legend. This entry was posted in Articles and tagged 13C, 14C, England, Hundred Years War, Late Medieval, Robin Hood. Bookmark the permalink.